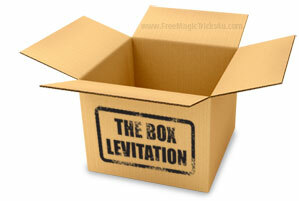 An Amazing Levitation Effect You Can Make at Home! This next levitation clearly shows both feet off the ground and if performed well looks stunning. The angles are slightly better than with the Balducci and you can levitate higher. The only downside is that your feet are inside a cardboard box during the effect! The thing I like about this trick is it's a grand illusion on a smaller scale. THE EFFECT: You show a cardboard box to your audience and place it onto a table. They can clearly see under and around it. Opening the top of the box you step into it. Once inside you open two flaps on the front so the spectators can clearly see your feet inside. You start to concentrate and slowly both your feet can be seen to rise off the floor of the box. You rise up to about 7 - 9 inches then slowly return to the ground. You close the front flaps step out of the box and take your applause! THE SECRET: You know the saying "It's all done with smoke and mirrors" with this trick it really is, well minus the smoke! The cardboard box is gimmicked with a mirror. CONSTRUCTION: This levitation illusion is really easy to build. You first need to go and buy a fairly large mirror. It is a lot easier to find a cardboard box that the mirror you have just bought fits into rather than having to get the glass cut to fit into the box - trust me! You need a mirror that has no frame or decoration around the edges. The mirror needs to be about 50cm square. Remember this is an approximate measurement and you will need to find the one that works best for you. You can get a mirror from your local D.I.Y store, some cheaper ones come with frames that can be easily removed. 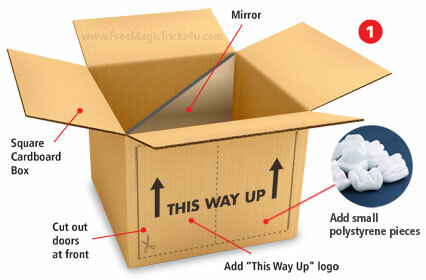 Once you have your mirror you need to find a cardboard box that the mirror fits into exactly from diagonal corners. The cardboard box you need has to be exactly square. Feel free to download the plan by clicking HERE. You can then print it off or view it on your computer at your leisure while constructing the illusion. If the cardboard box is not exactly square then the mirror placed diagonally will not reflect perfectly and will look very odd. You can get a cardboard box from your local grocery store, I'm sure if you ask nicely they will give you one. The box needs to be fairly sturdy with the usual top flaps. This is so that you can shut the box up before and after the illusion to stop anyone looking in from the top. You next need to cut two doors in the front of the cardboard box with some scissors or an Exacto knife. Leave a small border around the edge of the box. This hides the corners where the mirror fits from your spectators. (pic 1) Thats pretty much the construction done! TIP: Place some polystyrene pieces or shredded paper into the bottom of the box. This does not look out of the ordinary and helps disguise the line that the bottom of the mirror may create. PERFORMANCE: Lift up the box and show it to your audience, show all sides of it so they can clearly see you are not hiding anything. Place the box onto a table or platform so your spectators can clearly see under and around it. This also gets the box to more of a level that they can see your feet. Step up onto the table, open the top flaps and step into the box. 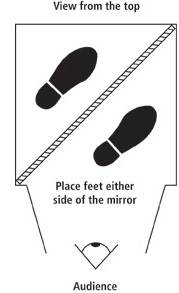 Now here is the clever part when you step into the box place one foot either side of the mirror (pic 3). Now when you open the front doors the spectators think they can see both your feet but in actual fact they see one foot and the reflection of the very same foot! Now all you need to do is slowly lift the foot that they can see up and it will look like you are levitating. TIP: Before you begin the levitation crouch over slightly so when you start to rise up your feet will look natural. If you are standing bolt upright it looks odd. Hold your arms out to the side this also heightens the effect. Do this slowly and really act as though it is taking a lot of energy for you to do this. Once you have levitated for a few seconds float back down and close the front flaps. Step out of the box, close the top flaps and take your applause! TIP: You could if you wish paint the box with stars and moons etc but I prefer to keep it as a plain box. It looks far less suspicious that way. You can draw arrows on the box pointing up, with the words "This way up" That is a normal thing to see on a box and adds a little humor to the illusion. You can download a "This way up" template HERE. TIP: Make sure the mirror is perfectly clean for the performance any dirt or dust may reveal it. Angle wise spectators need to be looking exactly front on, not from the sides. This is an excellent levitation that is so easy to make but looks really cool. Try it out! Click on Impromptu rise below to learn the next levitation.